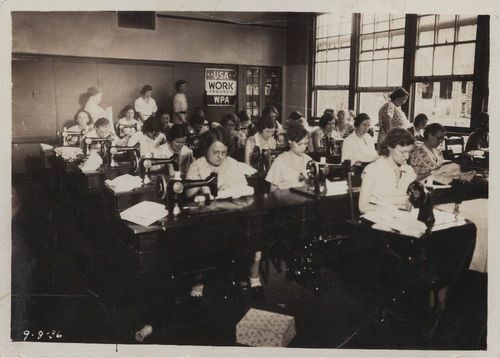 This sepia colored photograph shows a WPA sewing class in Topeka, Kansas. The Works Progress Administration, later renamed the Works Projects Administration, was created by President Franklin D. Roosevelt during the Great Depression to generate jobs and income for the unemployed. This relief program provided employment through a number of community works projects and vocational training for unskilled workers.